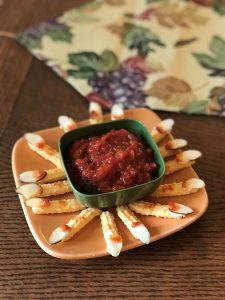 Need a low carb Halloween party snack? 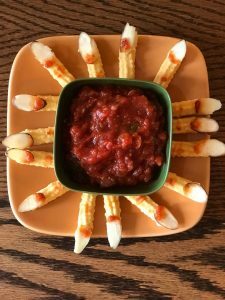 Try these easy, savory Chedz Witch Fingers that will only take minutes to throw together. No measurements are really required as well. You will surely impress your guests with this festive appetizer! 15 Pieces Slivered Almonds Select ones that resemble fingernails. Chipped fingernails work too! Lay out 15 pieces of slivered almonds (pick ones that are not too broken and that resemble fingernails. Chipped nails are fine). Dip the edge of 1 end of slivered almonds in marina sauce (or salsa or food coloring) and put a scant of cream cheese at the bottom back of the slivered almonds (about half way up). Be careful not to break the slivered almonds. Press the slivered almonds on top of a Chedz stick and gently press down gently so that you do not break the slivered almond. Repeat until finished with the number of desired witch fingers. Place on a serving platter with marina sauce or other dipping sauces. Enjoy!